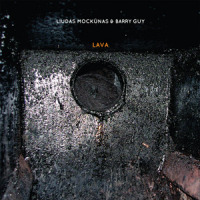 Iconoclastic saxophonists Mats Gustafsson and Evan Parker furnish the most customary duo outlets for master bassist Barry Guy, so Lithuanian reedman Liudas Mockunas' situation on Lava is an exposed one. However, he acquits himself well in a voice entirely his own. Co-founder of the No Business imprint, Mockūnas weighs in as one of the country's premier improvisers, appearing alongside an ever increasing catalogue of Baltic, Scandinavian, and US performers. Previous appearances have placed him in a Peter Brötzmann-like trio on Live at 11:20 (No Business, 2010) and in an impromptu freewheeling duet with Japanese pianist Ryoji Hojito on Vacation Music (No Business, 2011). In consort with Guy, the reedman waxed the seven completely improvised dialogues which form this limited edition LP at a 2011 performance in Kaunas, Lithuania's second-largest city, just a day before the bassist's encounter with The Thing, captured on Metal!. What makes Guy so exciting is the range of textures he extracts from his 5-string bass, the speed with which he marshals them, and the sheer musicality of his conception. In concert there is an added dimension as it is possible to appreciate his dervish energy and the physical theater of his extended techniques, which must be just imagined from this recording. Mockūnas proves a nimble and fluent partner. On soprano saxophone, his sound is pure though with an occasionally astringent edge of overtones, sometimes complemented by circular breathing to maintain unfeasibly prolonged tones, while on bass saxophone he contrasts plosive outbursts with stentorian bellows. Even though uncharted, there is a pleasing narrative arc to many of the cuts, as the two participants create structure in the moment. "Nebula I" builds to a spirited crescendo, then stops dead, while the second installment is a slow burning fuse and the third a brief explosion of tightly coiled soprano and frenetic bass. On "Fumarole," Mockūnas supplements his blown notes on tenor saxophone with rhythmic keypad pattering, matching Guy's multiple voices from sharp ticking plucks and tolling resonance, derived from inserting a metal pole through the strings, until working up to an impassioned frenzy. Such empathetic interplay permeates the entire disc, which concludes on a high point as "Dark Matter" exits to a haunting tenor dirge underpinned by ringing bass motifs, staking Mockūnas' claim as a worthy foil for the bassist.